National Guard Members Struggle To Keep Civilian Careers National Guard soldiers live in two worlds: They can be deployed in a crisis, but must support themselves and their families with civilian jobs. That's made harder by the guard's unpredictable needs. 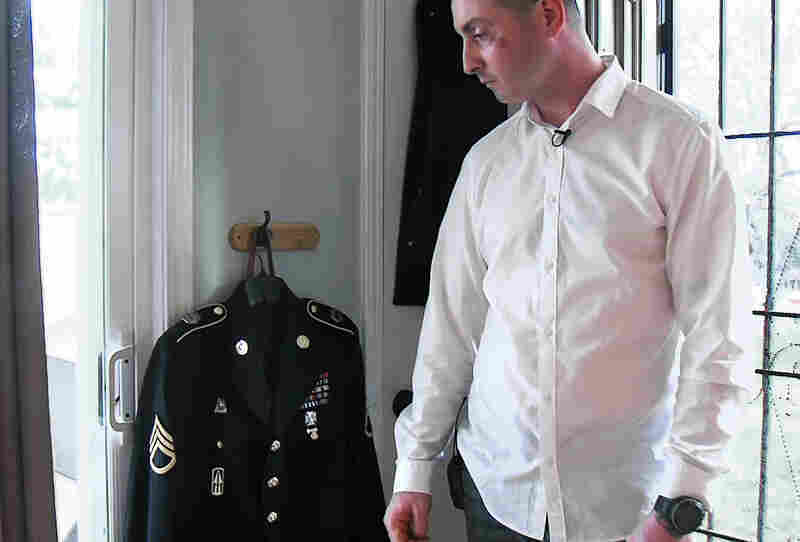 NPR — along with seven public radio stations around the country — is chronicling the lives of America's troops where they live. We're calling the project "Back at Base." This is the third of four reports this week about the National Guard. A version of this story has appeared on KPBS.org. Soldiers in the National Guard live in two worlds: They can be sent to war in a crisis, but they have to support themselves and their families with civilian jobs. In San Diego, Christopher Avila, 23, has been in the guard for three years. His commitment to the guard is one weekend a month and two weeks of training in the summer. But he says that's seldom how it works out in practice. "On paper they say one weekend a month, which is what you tell your employers," he says. "And sometimes the employer will have trouble with even one weekend a month. That's because it's like, 'Hey, I have to work around scheduling, we have to shift that weekend around, just so you can have the day off.' "
Weekends often can turn into four days, Avila says — and because he's an IT specialist, he often gets called up for extra training on new technology. He had a job with a civilian company where he was able to use his IT skills, but he got called to do guard training two weekends in a row — and then, there was another commitment. "Then I had to go for two weeks for training in Fort Hood for some new stuff my unit was getting, and when I came back, they came to the conclusion they had to let me go because I wasn't meeting their quota," Avila says. "Companies have to find a way around letting people go sometimes, so they don't get in trouble." Companies that hire people in the National Guard can't legally fire them for fulfilling their guard commitment, but Avila says others in his unit also have found themselves out of a job after going on one too many military training sessions. Avila found another job — at T-Shirt Mart — using his graphic design skills. One of his managers, Arthur Nava, says they're willing to work around Avila's training schedule. "I'd say at least 30 to 40 percent of our customers are military here in San Diego," Nava says. "We do have a good understanding of what it means to be in the military, and we try to help those people out as much as we can." For those in the National Guard, it's more difficult than if you're a veteran to get hired — veterans don't have to ask for the time off active guardsmen do, and employers earn federal tax credits by hiring them, unlike members of the National Guard who have not been deployed. And deployments for two-week trainings or state emergencies typically addressed by the guard — such as a wildfire — don't count. Also, guard members who have been on active duty for less than three years only get partial post-Sept. 11 benefits. Some states, including California, will provide some extra educational benefits to guardsmen. Avila says he hopes to be deployed to Iraq in October; if he serves a year, he can qualify for 60 percent of the post-9/11 benefits. That could lead to a better-paying job in IT, but he would still need to find an employer who was willing to let him go on frequent trainings and be ready to serve if there's a state-level crisis. Finding a job is hard enough, but building a career is even more difficult for people serving in the guard. Rida Sihab Mansor, 32, is a staff sergeant who's served eight years as a linguist and translator for the Army National Guard. He deployed for one year of combat duty in Iraq which earned him the decorations on his dress uniform. "I've got 13 medals," he says. "This is my bronze star. That's the highest. This is my Army achievement ribbon, anti-terrorism, and this is the National Guard one." Rida Sihab Mansour, a staff sergeant in the National Guard, stands with the uniform he wears when he serves on the honor guard at military funerals. He says he's positive that his guard commitments are making it more difficult to build a career. Because Mansour served as a full-time recruiter for two years, as well as being deployed, he qualified for the GI Bill and is finishing a degree in security management. But that has not been enough to get his foot on the career ladder. "I've applied everywhere, and I've got a pretty good resume," he says. "I've even applied to a couple of security companies and I've seen them hire the guy next to me who didn't even know how to fill out an application. They didn't hire me. And I'm going for a bachelor's degree within that field." When asked if he thinks his commitment to the guard is what's making it so difficult to build a career, he says: "I didn't at first, but I'm positive it does right now." Mansour earns a little money — about $100 a day — serving on the honor guard at military funerals. He says he enjoys the days when he can put on the uniform and serve. "I love it," he says. "I'm very proud of being part of that team. It's a really beautiful ceremony, and we train to be perfect at it." Mansour will soon have a degree in security management, and his deployment history qualifies him as a vet. He bought a condo — taking advantage of a VA loan — but now he has a mortgage to pay, so he still needs to find a career with an employer who is willing to let him go on frequent training and be ready to serve if there's a state-level crisis, or a federal deployment. Mansour plans to stay in the guard for 20 years, earning retirement benefits. At least that's something, he says, even if the civilian world doesn't offer him any security.